Getting to Male after a dreamy vacation on a gorgeous island of the Maldives could be a little shocking. Like you were a character from the 18th century who wakes up today and tries to cross the street with cars and buses speeding on the road. On the beautiful little islands of the Maldives in fact there are maybe just a few golf carts for the hotel guests at most. But in Male, cars and especially scooters keep speeding on the busy streets. Just think that in Male there is one third of the local population, which is around 100.000 people, who lives on a surface of just 5,79 square kilometers. 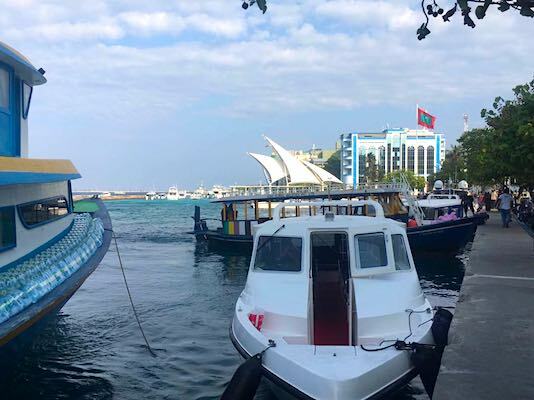 In fact most locals get to live in Male at a certain stage of their life because in the capital city of the Maldives there are offices and schools. On the little islands instead schools are just for the little kids. So at a certain age kids will eventually move to Male to keep receiving their education. And in addition to the locals there are also the curious travelers like us! You can easily visit Male in one day. I actually wouldn’t recommend spending more than one night in the capital city of the Maldives. So let’s find out together what you can do in Male in one day. THINGS TO DO IN MALE, MALDIVES. 1. BROWSE MALE LOCAL MARKET. 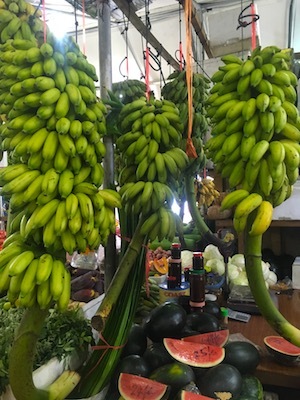 I have always loved browsing the local markets of the countries I visit. Getting around the different stalls of fruits and vegetables is somehow a way to know the products that the local territory offers. 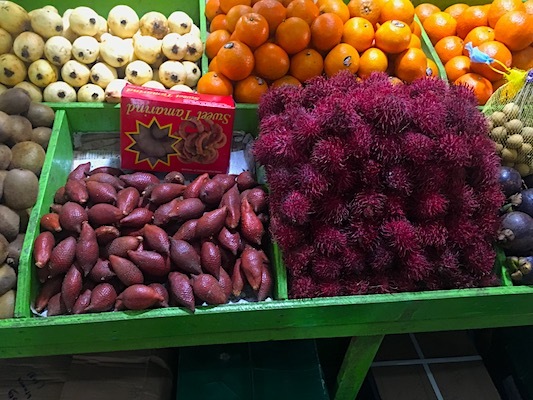 The market is very colorful and some fruits are so exotic that I had never seen them before. 2. BROWSE THE FISH MARKET. 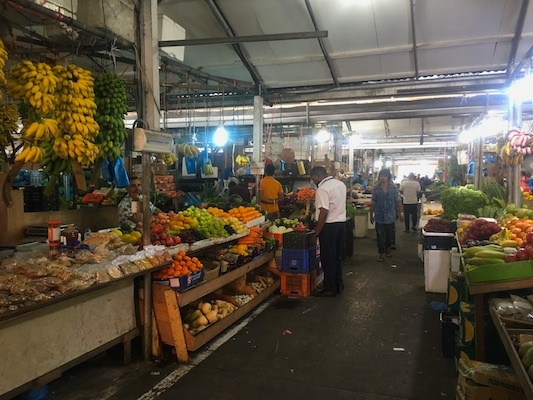 The fruit and vegetable market is for sure interesting. But it’s the fish market that really shows the habits of locals. People of the Maldives are fishing people. Fishing is the main economy’s resource of the country together with tourism. But I confess that I was really fast at browsing the fish market. You can probably imagine the smell that is around a place like that. No, not nice at all. Especially for people like me who really can’t stand the smell and taste of fish! 3. WATCH THE HUSTLE AND BUSTLE OF MALE PORT. 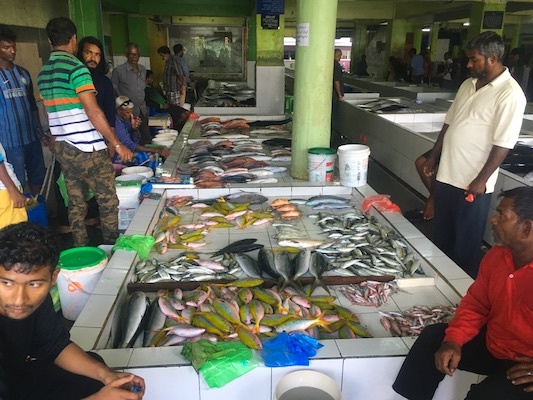 The fish of the market comes fresh from the port of Male. 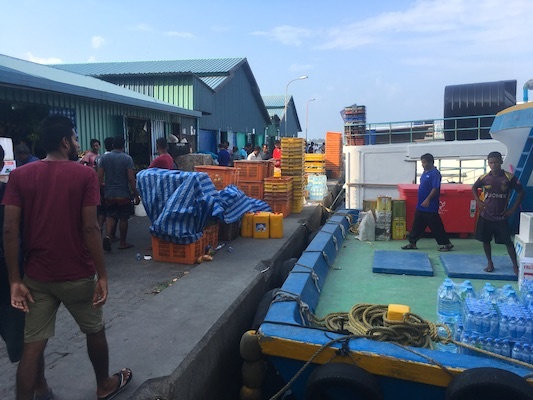 There is a lot of hustle and bustle around the port of Male and fishermen who keep bringing fish to the market. The quantity of fish that arrives at the market is huge. It looks like there is no end to the work. Besides many goods come to and from Male port from and to other islands of the Maldives. Watching the hustle and bustle of Male port is for sure a very authentic experience to have in the Maldives. 4. WALK ALONG THE SEAFRONT. Walking along the seafront is something you will really enjoy. Especially for the fresh breeze that blows in off the sea and gives you a break from the heat of the city. You can start your walk from the fish market towards Republic Square and go as far as you wish. If you want to walk all around the island it would take you an hour or so. At some point you will see something that might remind you of the Opera House in Sydney. It’s the Presidential Jetty, the jetty n.1 of the port of Male. 5. GET AROUND REPUBLIC SQUARE. 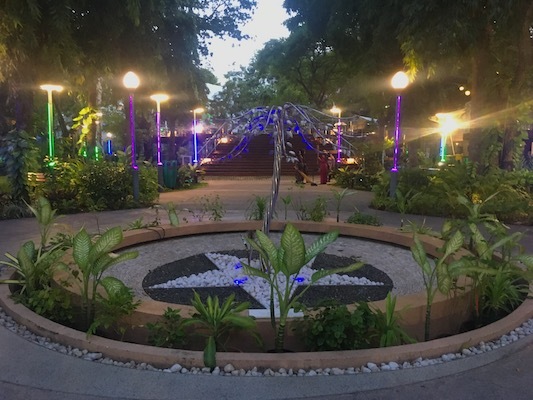 Republic Square (Jumhooree Maidhaan) is a nice square close to the Presidential Jetty. 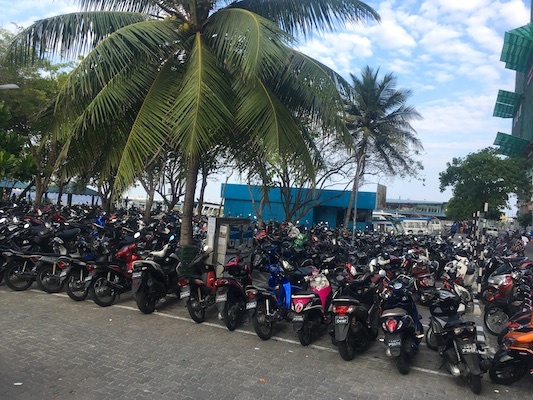 This is probably the most popular area in Male. 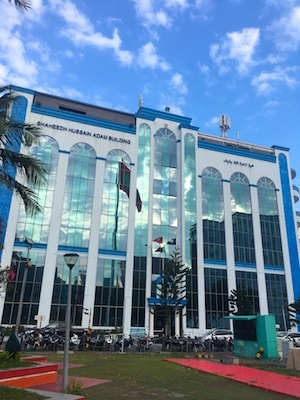 In the square you can see the elegant glass building of the police station and a pole with a huge Maldives flag in front of it. There have been several popular uprisings and coups around here so now the area is constantly monitored by the police. 6. 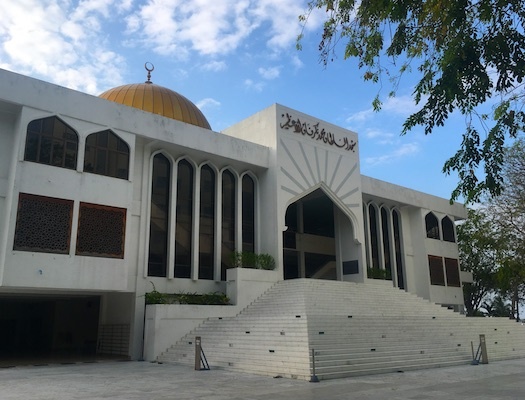 VISIT THE GRAND FRIDAY MOSQUE. 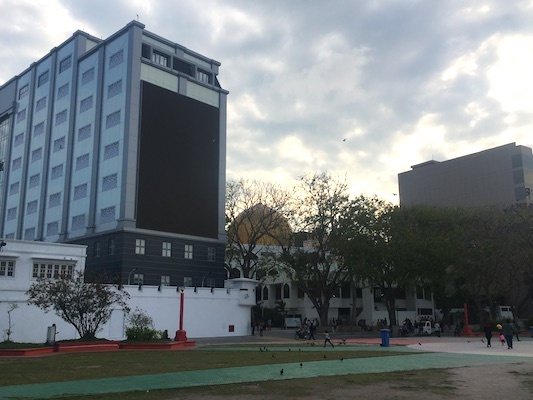 From Republic Square you can see the golden dome of the modern Grand Friday Mosque which is today the icon of Male. You can visit the mosque between 9:00 and 17:00 except during the prayer time. You have to wear long pants or skirts and cover your shoulders to get in. 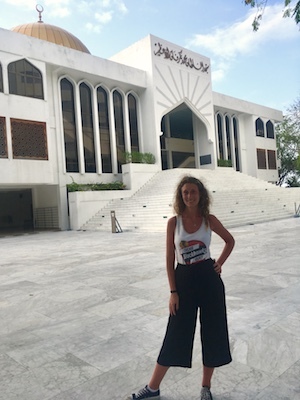 But just keep in mind that locals don’t like tourists to visit the mosque much so they might not let you in even if you are appropriately dressed. 7. WALK AROUND SULTAN’S PARK. Near the Grand Friday Mosque you will find the entrance to the gardens of Sultan’s park located right next to the National Museum. Well don’t expect to find a huge park with marathon paths but Sultan’s Park is for sure a nice area to walk around with a playground for the youngest travelers. The park is closed during the prayer time. 8. RELAX ON ARTIFICIAL BEACH. There are no natural beaches in Male. The only beach on the island is Artificial Beach. Yes I know. Probably an artificial beach is not that appealing after a dreamy vacation at the Maldives on amazing beaches. But if you want to go for the last swim, especially if back home it’s depressing cold and you are absolutely not ready to leave the warm weather of the Maldives, then take advantage and swim around the water of Artificial Beach. 9. TAKE A FERRY TO HULHUMALE. And talking about artificial, let me introduce you Hulhumale, a pure artificial island that you can reach in 15 minutes by ferry from Male. Many travelers and staff members who work on the private resort islands prefer Hulhumale to Male as a stop before their flight because it’s an island with quality accommodation and a nice beach. 10. EXPLORING THE REEFS OF THE MALDIVES ON BOARD THE WHALE SUBMARINE OF MALE. 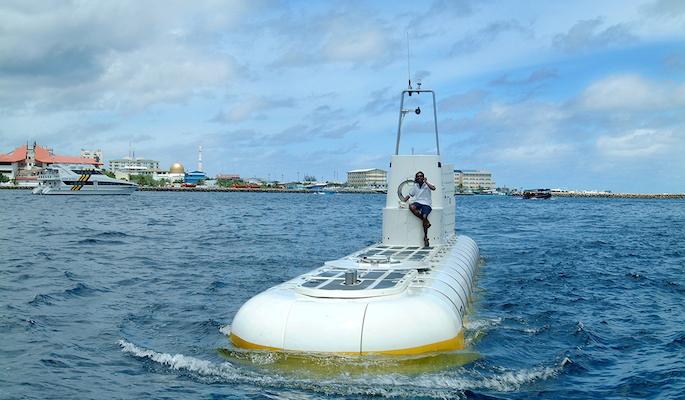 Getting on board the Whale Submarine is one of the most popular and appealing things to do in Male. Probably for some divers this is nothing special but the Whale Submarine offers for sure a great opportunity to explore the reefs to people who don’t feel comfortable diving. The trip is about 2 hours and a half and you can book at the reception of your hotel in Male or on another island close to the capital city. 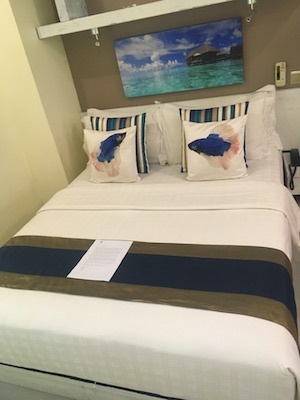 Alternatively you can check the official website of Whale Submarine for direct bookings. This experience is not cheap but if you have never seen the amazing underwater world before I wouldn’t miss this opportunity if I were you. WHERE TO STAY IN MALE, MALDIVES. Accommodation in Male is way cheaper than any solutions on other islands of the Maldives. My friends Silvia, Nataliya and I stayed at Somerset Inn and we really liked it. Rooms are quite small but for us this was not a problem at all as we were not looking for a huge space to sleep. We also really liked the buffet breakfast, which is included. There is no restaurant in the hotel but at the reception they give you a card to get a 15% discount to eat at the nearby 4-star hotel, the Somerset Hotel, where we had a very good dinner. 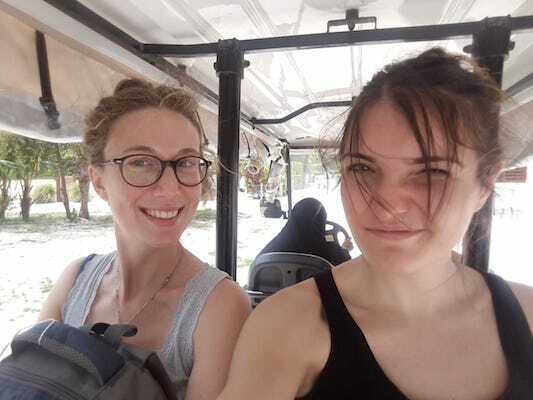 My friend Nataliya who works on a private resort island told me that her colleagues as well always choose this hotel in Male as it offers a good quality stay for a cheap price. MALE, MALDIVES: TO VISIT OR NOT TO VISIT? 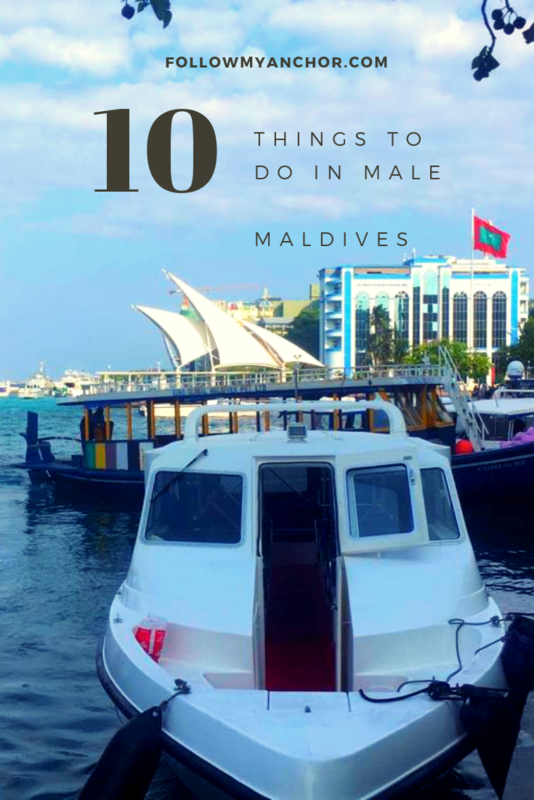 Male is quite chaotic and for sure is not one of those cities with many things to see that you really can’t miss. Is it worth it then to visit Male on a holiday at the Maldives? First of all because, as I already explained in other posts, staying in Male the night before your flight would give you more flexibility to arrange local transportation from whatever island to Male Airport. Second of all because when you visit Male you really get in touch with locals and their culture. Especially if you chose to spend your holiday on a private resort island where there is no interaction at all with locals. Well I hope that I convinced you to spend a nice day in Male! If you have any questions ask me in the comment or send me a message by filling the contact form.